Double the Fun with our Pattern Pak Plus which includes Pattern & Embellishment Kit! Santa & his woodland friends love their Northwoods Lodge & you will too! 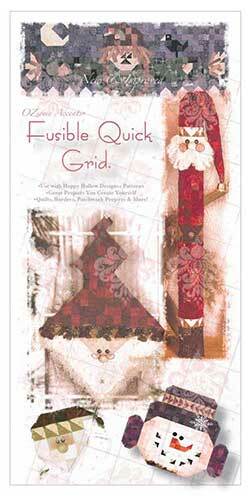 Make with OZsome Accents� Fusible Quick Grid - stitch squares by-the-sheet easy method. Embellishment Kit includes seven fancy snowflakes, white floss, gold jingle bells, OZsome Accents� Country Wire Spectacles, wooden nose, two ivory buttons & six black buttons. Also includes four Star Handmade Engraved Chunkee Buttonz�. Embellishment Kit makes one. Making multiple projects? Additional Embellishment Kits available & sold separately. Finished Size 20" x 33"